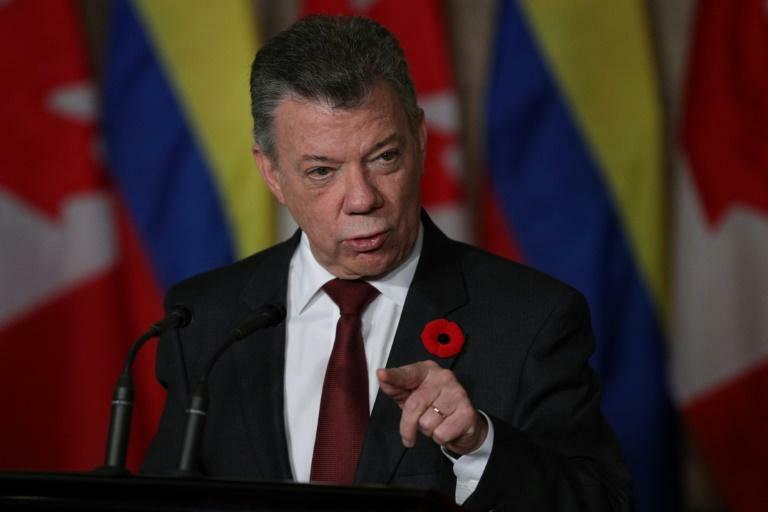 Visiting Colombian President Juan Manuel Santos on Monday condemned the killing of an indigenous leader last week by the ELN guerrillas in violation of its ceasefire with Bogota. "Of course, we condemn the assassination as we would any assassination because to us life is the most precious thing," Santos told a joint press conference with his Canadian counterpart Justin Trudeau. Santos said the killing would be investigated by a verification commission comprising the United Nations. As well, he added, "we will ask the regular authorities -- the prosecutor and the justice system -- to act as necessary." The National Liberation Army, or ELN, Colombia's last active guerrilla group, acknowledged killing the indigenous governor Aulio Isarama Forastero in the northwestern department of Choco last week. In a statement released Sunday, the group said it had been holding Isarama under suspicion of links with "military intelligence" and apologized to his family and loved ones for killing him. It said he was killed after he attacked a guard "with the resulting tragic outcome." Isarama's death was the first violation of the temporary ceasefire that went into effect on October 1 and is meant to last until January 9, as the Colombian government and ELN leaders hold peace talks in Ecuador's capital, Quito. Canada, meanwhile, committed to have Canadian police officers train Colombian authorities in an effort to bolster the ceasefire. "We've agreed to work together to establish a bilateral police initiative," Trudeau said. "This effort will support post-conflict policing efforts in Colombia and will see Canadian police providing training, capacity building and strategic advice to our Colombian friends." Some Can$78 million in aid will also be invested in youth, agriculture, human rights, mine clearing, and to support for the peace process. "Canada's support has been determining," Santos said, noting 77 projects funded by Canada that are already under way.